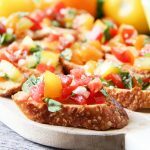 This Tomato Basil Bruschetta is a delicious and easy appetizer! Garlicky and so good. In a bowl, combine the tomatoes, onions, basil, olive oil and parmesan cheese. Slice up your baguette in to pieces for toast, about 1/2 inch thick. Then pop them in the toaster. In the meantime, melt your butter and garlic together. Then brush your toast with the garlic butter. Top with the bruschetta! And enjoy!